As Sega was gearing up for the launch of the Genesis, they knew they needed a killer pack-in game if they were going to have any chance of competing with rival Nintendo. As I mentioned in a previous post, the Genesis first launched in 1989 and was bundled with a port of the arcade hit Altered Beast. The game was a solid demonstration of the system’s graphical and audio capabilities and was certainly an indication as to whom Sega was marketing the system towards. It was gritty and violent, and it allowed you to transform into things like werebears and weretigers at various points in the game. Still, Altered Beast wasn’t going to sell any systems on its own merits. As fun as carving up the undead as anthropomorphic mutants was, this certainly wasn’t the flagship-type of franchise that Nintendo had built their own gaming empire upon. So Sega turned to a young programmer named Yuji Naka and his team to craft a new character to lead Sega into into battle against the Super Nintendo Entertainment System, which hit store shelves in 1991. It certainly didn’t hurt that Sega had a near two-year head start to build momentum before the launch of the SNES, but as the launch date creeped closer, the shadow of Nintendo’s fat plumber loomed large. His new adventure, Super Mario World was going to be included with each console, a tactic that was no doubt guaranteed to sell tons of hardware. Yuji Naka and his modest five-man development team began kicking around ideas for a new mascot. Originally, the team devised the idea for a rabbit-like creature that used his ears as weapons. As development went on, Yuji Naka had the idea of giving the character the ability to roll into a ball slam into his enemies to defeat them. Given the real-world hedgehog’s ability to curl itself into a ball, it was decided that the new character would be patterned after the animal. 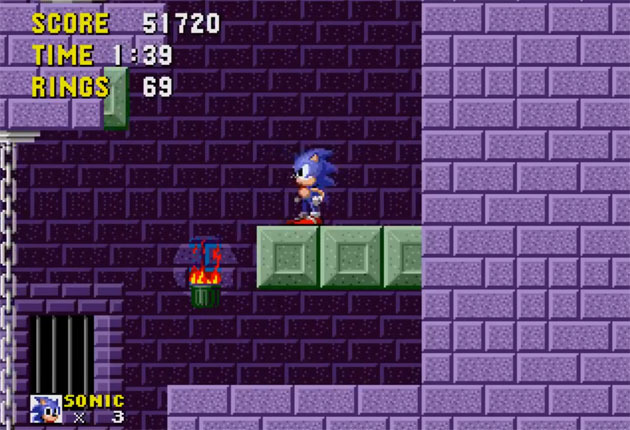 In the summer of 1991, Sonic The Hedgehog made its North American debut. Gone was Altered Beast from the Sega Genesis box and in its place was the new killer app that would soon make Sega the new king of the video game world. The SNES, along with Super Mario World, landed in time for Christmas that year. The battle for market dominance that year was incredibly intense, but after all the gifts had been unwrapped, twice as many Sega Genesis units ended up Christmas trees than their adversary’s new console. By spring of 1992, Sega widened their lead over Nintendo even more; taking control over 65% of the gaming market. Gaming’s Apollo Creed was knocked to the mat by its Rocky Balboa, and the balance of power now shifted away from Nintendo for the first time in nearly a decade. So what about pro wrestling in that time period? Fat men in glittery stormtrooper helmets. Seven foot giants dressed as wizards. Robocop. This was World Championship in the early 90s. Even by professional wrestling standards, it was completely absurd. When Eric Bischoff was promoted to Executive Vice President of the company, everything slowly began to change. Knowing WCW could not match the product that WWF was producing, he decided to simply offer something different. His first move was to convince Hulk Hogan to lace up the boots again. The Hulkster had been busy starring in every awful movie and television show that Hollywood’s worst had to offer, but no one can say no to Ted Turner’s wallet. Thus, Hogan agreed to terms with WCW, signing his first contract with the company at what was probably the most awkward parade of all time. It was clear that fans were still sick of the red-and-yellow shtick Hogan had been doing for over a decade. Crowds quickly turned on the once-popular icon, and Bischoff was quick to realize that Hulk Hogan needed to change. World Championship Wrestling as a whole needed to change. One Monday night in 1995, it did. The Monday Night Wars were about to begin. Ted Turner gave Bischoff a two-hour slot on primetime every Monday night on his flagship network TNT, and Monday Nitro was set to go toe-to-toe against WWF’s Raw each week. On its debut episode, WCW pulled a huge coup when Lex Luger, who had just wrestled for WWF the night prior, walked out to ringside during the live telecast. Just imagine playing Sonic The Hedgehog and Yoshi shows up mid-level. It was entirely astonishing and gave the show an aura of unpredictability that quickly became the show’s ratings-drawing quality. That was only the beginning, however. The next summer, the men known as Razon Ramon and Diesel in WWF, two of the promotion’s biggest stars, mysteriously arrived on consecutive episodes of Monday Nitro. No one know if the invasion was legit or a brilliant work on the part of WCW, but it ultimately didn’t matter, as more and more television tuned into Nitro every week instead of WWF’s Raw. 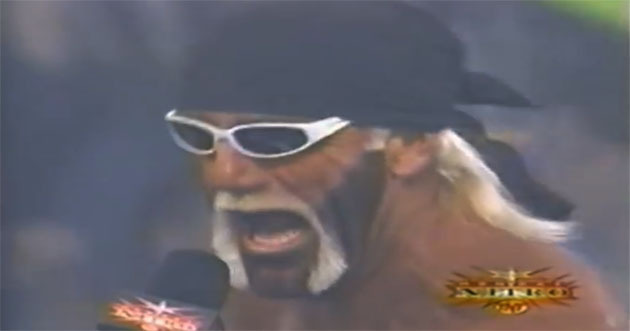 It was soon revealed that longtime good guy Hulk Hogan was in cahoots, instantly turning wrestling’s babyface posterboy into its biggest villain. However, this is what audiences had been waiting for. They were sick of the same face/heel dichotomy that had existed since the industry’s exception. Thus, the group now called the New World Order was cheered almost unanimously around the country. WCW finally overtook the ratings lead over WWF and would not relinquish it for 83 weeks. The stage was set. Two reigning kings now faced unprecedented threats to their respective thrones. Attitudes were changing, and so was the landscape of both the gaming and professional wrestling industries. Can We Stop with the “Samus Is Trans” Thing?